Search For "E-Commerce & IT Outsourcing" Companies in Tamworth, New Hampshire - Click Here Now! Make An IMPACT With Your Signage And Printed Material. Custom Signage, Offset & Digital Printing, Printed Labels & Stickers And Much More. Our Focus Is On Quality And Customer Satisfaction, Giving You A Smooth Transition From Design To Implementation. Let Us, Help You, Make An IMPACT! 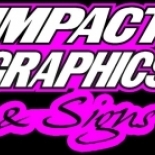 IMPACT Graphics & Signs in Tamworth is a company that specializes in Computer Related Services, Nec. Our records show it was established in New Hampshire.